JUST REDUCED,,, Relocated to NY forces the original owner to sacrifice this upgraded, end unit townhouse. Sit and relax on the covered front porch, , The home is equipped with 'Smart Technology'., open/close the garage door and control the thermostat from your smart phone. Entry door smart lock does not convey., Upon entry you are in an open Living Room, Dining Room and Kitchen, all done with large ceramic floor tiles. The kitchen offers Corian on the Counter tops, the breakfast bar and on the food prep Island. The roomy 42 inch cabinets are finished with crown molding. There's a sliding glass door leading from the kitchen to a private - PVC fenced patio area. There's a half bath between the Kitchen and the rear entry two-car garage. The Master Bedroom is on the 1st floor.The second floor consists of two good sized bedrooms, a full bathroom and a large loft area. Ryland Homes, the builder, offered an optional 4th bedroom in the loft area. Living at Waterside Pointe is like living at a resort. 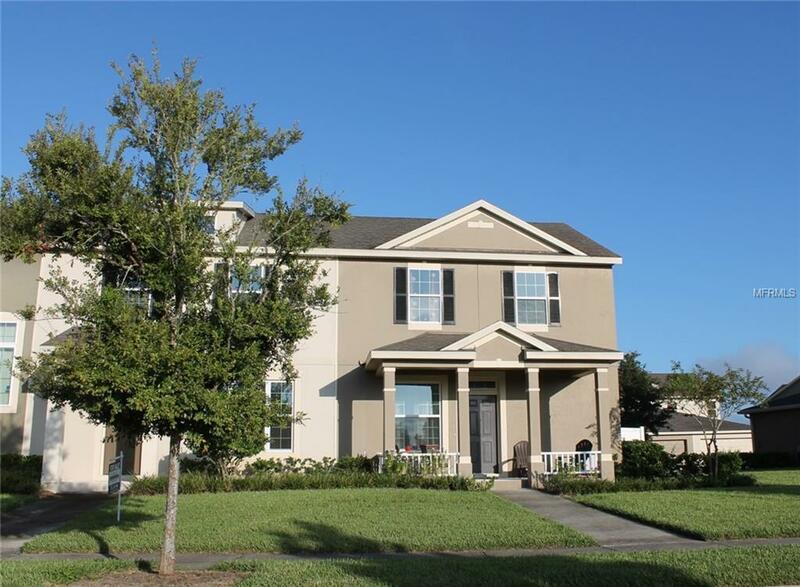 From the palm tree lined- gated entrance to the large clubhouse, a swimming pool with the largest water slide in the area, to open areas along a pond and a 220 acre lake, it's Central Florida living at its best ! The clubhouse area also offers an air conditioned fitness building. Other amenities include: a tennis court, a basketball court, soccer nets and a private boat ramp to the 220 acre lake. RV, Boat or Trailer owners can take advantage of an on-site, secured storage facility. Welcome home !